buynow/bloglater: The excuse is: "it's Sunday"
Oh first comment me!I looove coppering find it makes my supe dark eyes more sultry you will love this..if too scared to apply all over lid, just place it on the lower lid and blend with mythology or woodwinked on the crease..Lancome makes the best mascaras along with YSL so you re bound to love doll eyes, and black nail polish is great-tho i dont have this OPI one yet !great haul enjoy and update on liz earle tinted moisturizer! Happy Belated birthday! You look gorgeous simple today. Mini-breaks are the bestm especially when you're going interesting places. I love Lancome mascara so I really need to try this one out! Happy Belated - fellow Leo! I love Doll Eyes, it's fab. Pretty necklace. 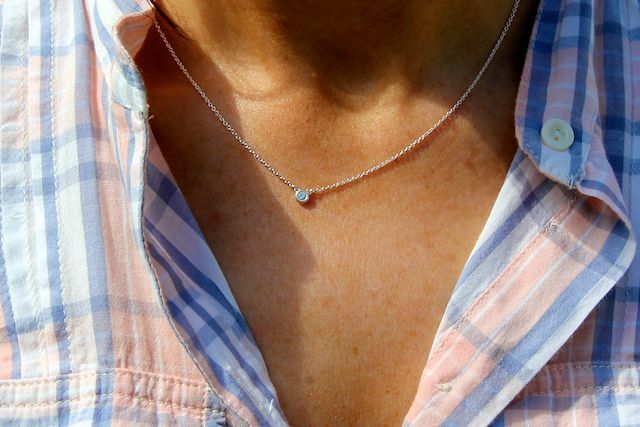 I am in love with dainty necklaces as well. happy belated birthday!! <3 I am a big J Brand fangirl and cannot recommend their jeans enough, sometimes a plain pocket is the best pocket :) sadly h&m jeans just don't suit me and are quite uncomfortable no matter which kind or size I try. also, you are not alone with the dark polish thing, my summer pedicure this year has mainly consisted of either a bright red, or Lincoln Park After Dark. @Vex - thank you! can't wait to try it..brush looks pretty amazing! Happy belated Birthday, i hope you had a lovely day... although the 5 cupcakes and champagne sound rather lovely indeed ;). I have the Liz Earle Sheer Tint and i really, really like it. I really need to try the Dolls Eyes Mascara too, love the name. The colors in the top are gorgeous, and I finally got my hands on a couple hollister jeans, they fit so nicely! good weekend-my best friend's wedding, tear ! What's on your wrist apart form Tiffany's bead bracelet? @ambernicolee - glad you liked them :) they are my go-to jeans and have been for years! @Jen - ooh there is a Jack Wills right by me. I confess i have never been inside an actual store...I should at least check them out in the next few weeks! I'm a big fan of dark colour in "summer", i think anything goes as long as youre confident in it, no matter what colour. Have fun in stockholm. Im so jealous, id love to get my hands on some weekday items. Happy Birthday, five cupcakes sound yummy. Love the outfit and the top is cute pretty and girly:) Love. Can't wait to hear your thoughts on the Doll Eyes mascara. Oooh Happy Birthday!! Hope you had a wonderful day! 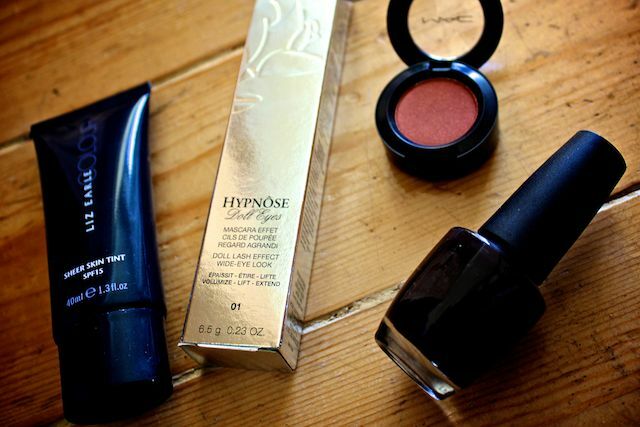 Lovely presents, I'd like to try that mascara and I love wearing black in the summer too! Happy belated birthday!! You look great, i love casual outfits like that that still look cool without too much effort! OMG cannot wait to hear about the liz earle tint... neeeeed to get my hands on that if the reviews are good!! Will keep my eyes peeled! happy rather belated birthday! i love your outfit - the simplicity of it works to great effect! i love love LOVE Coppering, such a gorgeous color! blend it with a gold shadow! happy belated birthday, laura! i hope it was a good one. i like wearing blackish nail polishes year round, but i try to mix in some lighter colors in the warm months. I absolutely adore Mac's Coppering eyeshadow, my favourite way to wear it is with Woodwinked - either Woodwinked on the lid and Coppering in the crease or Woodwinked on the inner corners of your lid and Coppering on the outer corners (trust me, it looks gorgeous!!). I also like to wear it with Ricepaper (or any light creamy champagne colour) on the lid and then Coppering in the crease. Yay for August babies, my birthday was on the 12th! happy belated birthday! :) and i love that gap top...love the colors! That OPI polish sounds lush! Happy belated birthday, too! I love the shirt, you look so effortlessly casual! On Stockholm & dining: Eat sushi at "East". Located nearby Stureplan. (You know you're there when you notice guys wearing to much hairproducts and a tan that only Pamela Anderson can do justice). @jamman - slicked back hair right? :) i went to the stureplan last trip and wow...they are all at it! The shirt is gorgeous!! Really pretty colours - perfect sunday outfit! I love the shirt, and I also love that you post realistic ootd's - because they look as good in real life as they do in pics. I've seen "fashion victims" in real life - might photograph amazing but they look silly in reality. I also have lincoln park after dark and can agree - GORGEOUS! cupcakes and champagne is my favorite meal. Happy birthday! great post, blog and outfit! A belated happy birthday, I'd love to hear what you think of the mascara as I'm definitely tempted by it too. I love the necklace - so pretty! I have been missing your videos, but I am really enjoying your blog!! Love your outfits and great purchases :). I have a similar necklace from Tiffany, but in yellow gold, and I absolutely agree that it looks stunning with anything strapless! So simple and chic :). Love that little Tiffany necklace and the Hollister jeans look like they are a really good fit. Glad to have found your blog today. Welcome back!! Are you back on YouTube? hope you have a lovely birthday! I love Doll eyes, you have to really build it up but it makes your lashes really long and separated. I think Lancome mascaras are amazing though, my all time favourite is Hypnose Drama, thats major lashes in a tube! Love your necklace, So pretty! jeans looks that gorgeous make you so outfit. Hi Laura, is that a silver or white gold necklace? It looks amazing!!! popups for a little while, to make sure that you can tinderapptips equally as you would certainly on your smartphone. The Sarahah app has obtained fantastic evaluations Sarahah APK Download for Android Latest Sarahah allows the users to leave anonymous comments or questions.